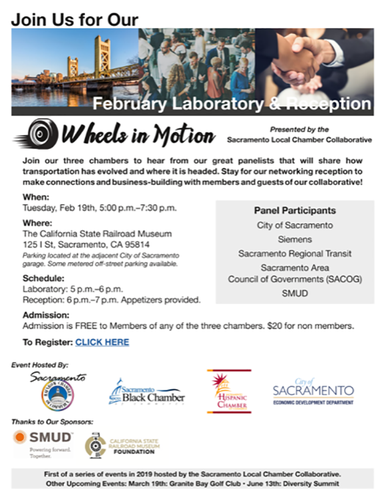 Join us and our cohosts, Sacramento Hispanic Chamber of Commerce and Sacramento Black Chamber of Commerce, for Wheels In Motion, an evening of networking and business-building presented by the Sacramento Joint Chamber Collaborative in partnership with City of Sacramento Economic Development. Laboratory 5 to 6 p.m.
Multi-Chamber Mixer 6 to 7:30 p.m. Thanks to our sponsors SMUD and California State Railroad Museum Foundation! Panel 5 - 6 p.m. Reception 6 - 7:30 p.m.